WESMAR (Western Marine Electronics) will introduce a 50-square-foot mega fin at the Fort Lauderdale Boat Show on October 27-31 in Florida. Designed for luxury yachts, charter and super yachts, these new fins, coupled with WESMAR’s triple axis digital DSP4800 control electronics, are designed to reduce up to 90% of vessel roll. They are rugged with a neutrally buoyant design that adds lift, and are designed with added strength and reliability to meet the high performance requirements of vessels up to 250+ feet. The system features a high-speed triple axis gyro system that uses a powerful digital processor and proprietary programming to combine multiple system capabilities. Three models, including an upgrade package for existing stabilizer users, are available. WESMAR’s technology changes the dynamics of roll fin stabilization by using advanced digital signal processing and a proprietary gyro to predict vessel behavior. The system memorizes roll characteristics of a boat in order to preempt rolling. The roll velocity, acceleration and the vessel’s roll characteristics are delivered by digital link to WESMAR’s closed proportional hydraulic system. A wheelhouse display shows real-time vessel roll and fin movement. 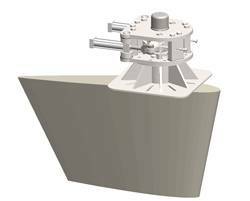 The fins are a composite structure of a fiberglass skin wrapped around high density structural foam and 17-4PH stainless steel shaft welded to a steel core plate. The exterior of the fin uses a marine grade gel coat that provides a smooth finish and protection from the elements and is easily paintable to match the color of the vessel. The fin shape used is to NACA 0015 standard fin profile and provides optimum lift to drag ratios and geometric size. WESMAR’s complete line of roll fin stabilizers, all stainless steel bow and stern thrusters, and navigation and sport fishing sonar will be on display in Booths 699 and 700 in the Yacht Builders and Designers Tent and in Booth 425 in the 400 tent at Bahia Mar.